The 10 athletes and sport builders making up the Class of 2014 represent the largest class of inductees to enter the Ski Hall of Fame since 1984, when there were also 10 inducted. Among the inductees are Olympic champion snowboarder Ross Powers, World Alpine Championship medalist Erik Schlopy, noted big mountain skier Chris Davenport, ski instruction pioneer Curt Chase and Smith. Others include resort designer Joe Cushing, World Cup race winner Kristina Koznik, alpine development leader John McMurtry, Thoren and Ralph Miller, one of the great American ski racers from the 1950s. Their induction will take place April 11, 2015 during the Skiing History Week and Hall of Fame Induction at Steamboat Springs, Co. There will also be a special enshrinement ceremony weekend for honored members at the home of the Hall of Fame at Ishpeming, Mich. Sept. 18-20, 2015. The new inductees will bring the total to 404 honored members in the U.S. Ski and Snowboard Hall of Fame. Nominees are screened by a Hall of Fame Selection Committee before going on a ballot where around 200 members of the Hall of Fame National Voting Panel elect the newest Honored Members. The nomination process is open to all, with detailed information available at skihall.com. Said Tom Kelly, chairman of the U.S. Ski and Snowboard Hall of Fame, “The 10 inductees who were elected into the U.S. Ski and Snowboard Hall of Fame come from all areas of our sport from skiing to snowboarding, ski instruction to athletes and big mountain skiers to alpine racers. Jeannie Thoren (Minnesota) is regarded by many as the “Johnny Appleseed” of women’s skiing. She was a pioneer in developing women’s specific ski equipment, which helped women ski better because they were using equipment better suited to their physique. For nearly 20 years, beginning in 1988, she conducted an estimated 70 women’s ski equipment seminars annually around the country in her effort to improve the sport for all women. When Jeannie Thoren started skiing in the 1960s there was no women-specific ski equipment, so she began to customize her own. Tracing a direct correlation between changes in her gear and improvement in her technique, she made it her mission to help other women ski better by making their equipment better. She held the first women’s gear clinic at Buck Hill, Minnesota in 1981. And she traveled every winter 1988-2006 with a trailer of gear in tow. Jeannie conducted as many as 70 “Thoren’s Women’s Ski Equipment Seminars” per season throughout North America, personally helping thousands of women improve their skiing. Recognizing that women have smaller feet and a lower center of gravity than men, she focused on better fitting boots, heel lifts in boots, cants under bindings and moving bindings forward on the ski. 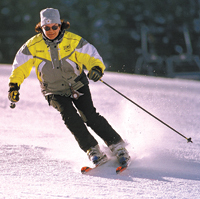 In 1986 she designed what is believed to be the first women’s ski, for the Austrian company Blizzard. By extension of her clinics, her work as a marketing consultant and attention from the ski press, she created awareness of and demand for women-centric ski gear, raising the bar for the entire industry and improving the sport for all women. The Exclusive Carve Ski she designed for Dynastar became Ski magazine’s 2007 Ski of the Year. In 2009, she opened the Jeannie Thoren’s Women’s Ski Center in Vail, Colorado. 1986: She designed the first woman-specific ski for Blizzard Ski Company of Austria. 1988-2006: She held women’s gear clinics throughout North America. 1999: She was recognized by Skiing Magazine as one of the 25 Most Influential People, and recognized by Ski magazine as one of the Top 100 Most Influential People in the History of Skiing. 2000-02: She was ranked as one of the top 100 ski instructors in America. 2003: Jeannie received the Carson White Golden Quill Award for outstanding contribution to skiing by the North American Snowsports Journalist Association. 2007: She designed the Dynastar Exclusive Carve Ski which was named Ski of the Year by Ski magazine. Dr. Robert Smith (Idaho) was a dentist turned goggle inventor who changed skiing, which was his passion, when he founded his eyewear company in the 1960s. Smith Optics was founded literally from his kitchen table in Sun Valley in 1965 where he developed a thermal lens goggle that did not fog up when it was being used on the ski slopes. Anxious to give back to his skiing passion, Smith toiled at home with dental tools, glue and foam to make each goggle by hand. He constantly improved his goggles, by way of adhering to advice, ideas and criticisms he solicited from users. Dr. Smith passed away in 2012. The next year, he was elected to the Sun Valley Ski Hall of Fame and Intermountain Hall of Fame. Curt Chase (Colorado) was an innovator and motivating force in the field of ski instruction for over 40 years. He served as a survival training Instructor of the U.S. Army’s 10th Mountain Division and later held the same positon for the Strategic Air Command. He contributed to what is now known as the American Ski Technique and was one of the eight founders of the Professional Ski Instructors of America. He passed away in June of this year. Joe Cushing (New Hampshire) was a pioneer in ski area planning and design. Working with the legendary Sel Hannah he designed over 400 ski areas in North America and the world. Among those areas where his impact can be seen are Loon Mountain and Bretton Woods in New Hampshire, Sugarbush and Stratton in Vermont, Copper Mountain and Keystone in Colorado and Deer Valley in Utah. Chris Davenport (Colorado) is widely regarded as one of the world’s premier big mountain skiers. In 1996 he was recognized as the World Extreme Skiing Champion and four years later was the International Freeskier’s Association‘s World Freeskiing champion. In 2007 he became the first person to ski all 54 of Colorado’s 14,000 foot peaks in one year. He has been featured in 30 ski films. Kristina Koznick (Colorado) was an outstanding slalom racer from the Midwest who began her career under the coaching direction of Eric Sailer (Ski Hall of Fame Class of 2005). With six national titles and six World Cup victories she finished second twice in the season-long FIS World Cup. She was named to three Olympic teams and competed at six World Championships. John McMurtry (Colorado) was a U.S. Ski Team coach during the 1980s, a period that saw several of its members win World Cup titles, Olympic medals and the only Nation’s Cup Award for the U.S. Alpine Team. In 1987 he became the U.S. Ski Team’s development and later alpine director establishing a regional development program that continues to bring thousands of young athletes into the sport including Picabo Street, Bode Miller, Lindsay Vonn and Julia Mancuso. Ralph Miller (Kentucky) was one of America’s top skiing competitors in the 1950s where he excelled in four event competitions (downhill, slalom, jumping, cross country). He won or placed in the top three of many of the top competitions held during this time and frequently was able to beat Olympians like Stein Eriksen and Othmar Schneider. In 1955 he set a world speed record of 109 mph which stood for 15 years. Ross Powers (Vermont) is the fourth person from snowboarding to be elected to the Hall of Fame. He won the first U.S Olympic medal in snowboarding, a bronze, at the 1998 Nagano Games and was the Olympic halfpipe champion in 2002, leading an American podium sweep. Two years earlier he had won a World Championship. During his career he held every title in halfpipe snowboarding. Erik Schlopy (Utah) was a three time Olympian and seven time national champion who had one of the longest and most successful careers in U.S. ski racing history. He was a World Pro super giant slalom champion and a bronze medal winner in the giant slalom at the World Championships in 2003. Throughout his career he demonstrated not only his great ability but also his perseverance and tenacity coming back from many serious injuries to compete with the best in this sport. Thoren became the “Johnny Appleseed of women’s skiing,” traveling every winter 1988-2006 with a trailer of gear in tow. She conducted as many as 70 “Thoren’s Women’s Ski Equipment Seminars” per season throughout North America, personally helping thousands of women improve their skiing.